Some parents take pride in their kids knowing how to read by four years old. Others that their kids can ride a bike by three. Still others that their kids were potty trained by two. Why any parent would take pride in these when topology and number theory are within their child's grasp is beyond me. Could my kids understand Prime Numbers? 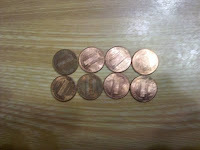 My boys over the course of about 6 months had collected a number of pennies. 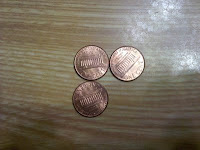 They were mostly garnered from doing jobs for Mom and Dad, but I'm sure they found some in our couch once or twice. I can only hope that it was always our couch. They brought them to the table before dinner, and I was trying to think of something that we could do with them in order to teac h them some principle. We decided to create mazes out of the pennies, with the pennies as the walls. While that was pretty fun (the boys liked "trapping people" inside their maze more than actually making a functional maze), it wasn't really what I was looking for. Then, I remembered something I read about prime numbers being "hard" numbers because they couldn't be broken down into smaller parts and how that could be shown geometrically. 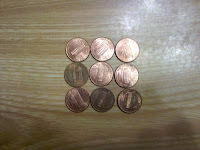 So, I laid our four pennies out for the boys and asked them to make a square out of them. Okay, so he didn't quite get that an "L" isn't a square and we talked about it. He already knows his shapes, so it didn't take a lot of explanation. 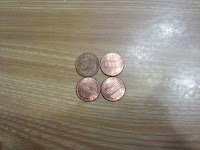 Anyway, "why can't we make three pennies into a square, boys?" Zac: "We could make a triangle." 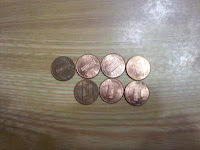 Remi: "Because there aren't enough pennies." 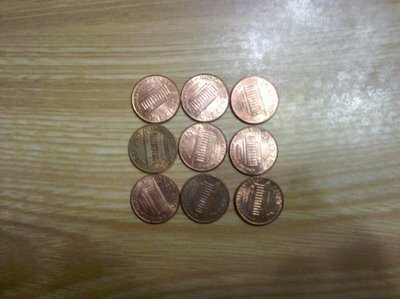 Next, I gave them nine pennies, and asked them to make a square. This took a little more work, but they both figured it out. I took a penny away to make eight. 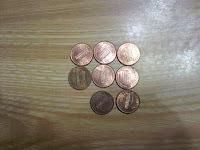 I explained that this time, they wouldn't make a square, but instead a rectangle. Again, they both know their shapes, so they knew what the end product should look like. 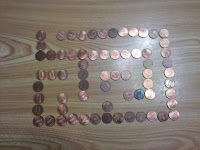 This took a little prodding (at this point, they were starting to wonder what kind of game this was), but they made it. Awesome. Finally, I took one more away to make seven pennies. I asked them to try and make a rectangle again. Here is where Remi and Zac's personalities differ. Remi quickly became frustrated and tried to show me "hybrid" kind of solutions. He was upset because he thought that he should be able to do it and that he wasn't "doing it right". Zac was much calmer about the fact that it couldn't be done. 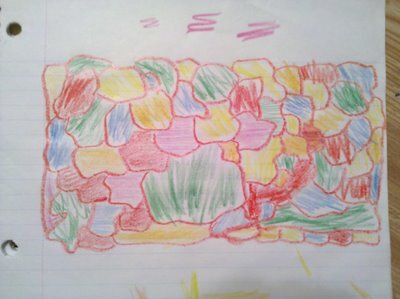 In fact, I could see his mind start to wander once he couldn't find a way to make it into a rectangle. Then came the word: Prime. If the number of pennies can't make a rectangle or a square, that number is called "prime." The discussion kind of stopped there. Kids have about a 5-minute attention span, and, including the mazes, we had easily been talking for 15 minutes. 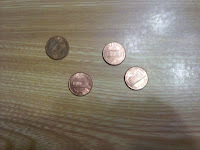 Still, I made one last attempt and asked them about 11 pennies. Sadly, they had lost interest. Bummer. So, we'll try again another day. 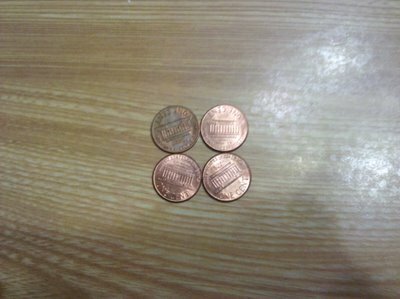 Could my kids understand the Four-Color Theorem? Another day, another mathematical principle to exercise the spatial reasoning muscles of my budding nerds. A couple of Saturdays ago, Kristi's mom was really nice and invited Kristi to go out shopping for her birthday. So, I had the kidlets for the afternoon. The girls were down for a nap, and I saw my opportunity. Remi threw himself at the problem while I started drawing a map for Zac. Both boys concentrated a great deal while I started folding clothes. After a few minutes, I heard, "Daddy, I'm blocked!" I came over to confirm the calamity. He had indeed colored himself into a five-color corner. So, he dutifully got out another colored pencil and kept going. The same happened with Zac a couple of minutes later. I was pretty sure that they would be able to keep it to five, but, to our mutual dismay, Remi later exclaimed, "I'm blocked again!" The same happened with Zac. Remi finished his with six colors, and Zac still had about a dozen countries left to color. I noticed in Zac's remaining countries a particularly insidious one that touched several other countries. 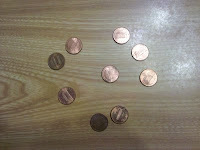 So, I sat down with them and helped Zac finish his to teach the principle. Setting aside all the colored pencils but one, I asked them how many of the remaining twelve countries we could color with just this one colored pencil. While it wasn't immediately clear to any of us, we looked at each country one by one and figured that five could be colored with that one color. 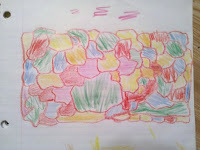 Then we pulled out a second colored pencil. How about this one? We could color four. A third (I was starting to get a wee bit nervous, but there were only three countries left). We colored two. A fourth, and we colored the last country. The boys caught on right away. Again, Remi and Zac's personalities were manifest. Remi wanted me to draw another map right away. Zac decided to play with stickers or something. Anyway, Remi succeeded on his second attempt. 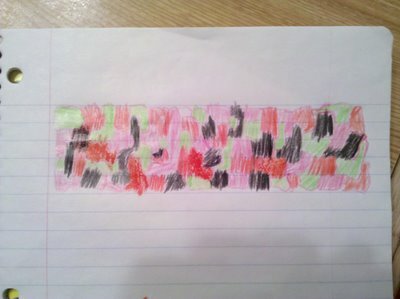 The map was colored with only red, pink, green, and black. Congratulations, Remi!